At present, many projects embed smart LEDs “multiple LEDs dynamically controlled by computers” into clothes or accessories to support novel expressions or daily activities. However, most of them do not consider the “sparkle” of traditional jewelry. 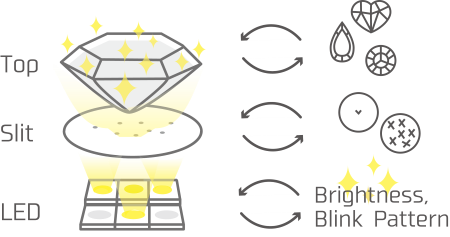 We propose a presentation technique for interactive jewelry called “Sparklry”, which can present “sparkles” on a jewel stone using internal LEDs. These sparkles are designed by integrating (1) a traditional jewel, (2) a light shielding sheet with small slits, and (3) an LED array. We developed a prototype and several examples of jewelry to explore appropriate designs of slits and LED patterns. Moreover, we developed two prototypes. We prepared Swarovski stones that are beautifully cut from all directions. The slit sheets are created from silver Origami papers. The LEDs are designed as a 3 × 3 LED matrix. The figure below shows the two blinking examples of the same jewelry with/without our system. Figure 2: Examples of jewelry augmented by our system. 2019 © okimaho's web. Crafted with love by SiteOrigin.